In accordance with Grossmont College policies, attendance will be recorded during each class meeting that the course is scheduled during the academic session. Students are expected to be present during the entire class and demonstrate active, engaged learning with the curriculum and assignments while attending each class session and in-class laboratory practice. Instructors are obligated, at the beginning of the semester/academic session, to announce to their students their policy regarding excessive absences. When absences exceed the number of hours that a class meets in a week, the instructor may drop the student from the class for excessive absences. It is the student’s responsibility to discuss anticipated extensive absences with the instructor. Make-up work for an absence of any kind must be completed to the satisfaction of the instructor. No absence relieves the student of the responsibility of completing all work assigned. For lecture-only courses, such as PHOT 154 – History of Photography which are scheduled to meet for 2.5 – 5 hours per week depending on course schedule, the third unexcused absence could result in your being dropped from the class. For lecture | lab courses which are scheduled to meet for six hours per week, the third unexcused absence could result in your being dropped from the class. Students may add courses only during the official “Add” period using an “add code” issued by the instructor and submitting the completed “Change of Program Card” to the Admission and Records Office. It is the student’s responsibility to officially drop courses they are no longer attending. If a course is not officially dropped, you may receive an “F” for the course. Students are subject to adhering to the policies and procedures of the Grossmont-Cuyamaca Community College District, as well as all federal, state and local laws. Student conduct must conform to District and College rules and regulations as well as course policies. If a Student Code of Conduct violation occurs while a student is enrolled, he or she may be issued administrative action, including warning (verbal and/or written), written reprimand, suspension, and/or expulsion. For additional information on the Student Code of Conduct, please consult the Grossmont College Catalog as well as the Assistant Dean of Student Affairs. Misconduct not listed in the catalog may also result in discipline if good cause exists (Educational Code Section 76034). It is the responsibility of each student to understand the actions and behaviors that constitute academic dishonesty, including plagiarism and cheating, within each class as well as other venues on campus. Students are encouraged to ask questions of instructors and are expected to read the college’s statement on Academic Fraud (located in the class schedule). Penalties for actions inconsistent with classroom, library and College expectations for academic integrity range from a failing grade on an assignment, quiz, exam, paper, or project (which may lead to a failing grade in the course) to, under certain conditions, suspension, or expulsion from a class, program, or the college. For more information and/or further clarification, please consult with your instructor or contact the Student Affairs Office. Students requiring reinforcement of concepts or additional help to achieve the stated learning outcomes for a course are referred to enroll in IDS 198, Supervised Tutoring. To add these courses, students must obtain Add Codes from the appropriate staff. Please refer to the Tutoring Section in the current class schedule for contact information. Students facing food or housing insecurity are encouraged to contact a Grossmont College Basic Needs Liaison (their names are listed in the web link provided below) or you can send an e-mail to Grossmont.BasicNeeds@gcccd.edu to request information or assistance. At the start and throughout the semester, your instructor will provide and review the general safety and emergency preparedness information and instructions for various emergency situations, including an active shooter threat, earthquake, fire safety, personal safety/well-being and evacuation. In addition to discussing and reviewing the emergency preparedness information and protocols for emergency and non-emergency situations, your instructor will provide a facility walk-thru to review building protocols in the event of the any of the above emergency situations, including emergency exits and strategies for safely exiting the facilities, fire alarm and extinguisher locations, eye-wash stations, and use of the emergency phones in each room. It is expected that all students will conduct themselves in a manner that is consistent with common courtesy to all other students, faculty, and lab technicians. The Photography Program uses certain chemicals and other materials that create hazardous, universal and/or special wastes that must be disposed of in a responsible manner so that they don’t contaminate the environment and/or threaten student health. The College and the Photography Program is required to follow Federal, State, Local and College Policies with regards to proper disposal of these chemicals and materials, including analog photographic chemicals such as developers and fixers, digital inkjet printer cartridges and batteries. In each class, instruction and handouts are provided for each student to understand and follow the proper handling and disposal policies, and is reinforced with signage throughout the Photography Program facilities. Students are expected to dress appropriately for a laboratory class. VAH Department and Photography Area Studio Courses are officially formatted as combined Lecture | Lab sections. This means that the lecture or lab portion of the class may occur anytime during the scheduled time block for the course. When working in the analog photography areas, including the film developing rooms, print finishing area and darkrooms, closed-toe shoes must be worn always per the darkroom safety requirements. Per OSHA requirements, safety glasses and disposable gloves are required to be worn in the film processing rooms, all darkrooms and alternative processing working areas. To insure a productive working environment for all students, please clean up your work area by returning all items to their proper storage area upon the completion of class and lab. Computers in all areas of the photography area, including the classrooms, digital lab, print finishing area and studio, are strictly for use as it pertains to photography curriculum activities. Using the computers for personal email, downloading of music, and/or other inappropriate use will be considered a violation of the Student Code of Conduct. Computers are required to be turned-off at the end of each class. Students are required to save their digital photographic work on an external storage device, including portable external drives and/or thumbdrives. The Thawspace (blue polar bear icon in upper-right corner of the computer desktop) is for temporary storage only and files may be removed on a regular basis to insure optimum performance of the computers and software. The subjects and materials covered in this course may sometimes be of such a nature as to be offensive to an individual’s personal beliefs. Politics, religion, sexuality and/or morality have often been the content of artists’ efforts and will be discussed openly in a mature manner to facilitate a greater understanding of varying perspectives. There is no food and/or drink allowed in the film developing rooms, print finishing areas, darkrooms, digital labs and studio. A securely capped drink may be stored in the storage space provided and must be taken into the hallway to be consumed. In consideration of fellow classmates and to insure a thoughtful and productive learning environment without disruption, please set smart phone | watch settings so notifications received are discrete, including setting the phone | watch on a vibrate setting. Please put smart phone | watch away when working in any of the analog photography laboratories, including the film processing rooms and print darkroom. The operation of a smart phone and/or smart watch can expose light-sensitive photographic materials in the film processing rooms and print darkroom. If at any point the smart phone | watch is continuously being activated and becomes disruptive to instructional activities, this could be considered a violation of the Student Code of Conduct and will result in administrative action, including a warning and/or being asked to leave the classroom, and/or a short-term suspension. Per District and College policies and in order to prevent discrimination on the basis of disability, the District will allow an individual with a disability to use a service dog or miniature horse in District facilities and on District campuses in compliance with state and federal law. The Board shall designate that District property be closed to all other animals, unless the animals are involved in the instructional process. A “service animal” for purposes of this procedure means any dog (or miniature horse, as provided herein) that is individually trained to do work or perform tasks for the benefit of an individual with a disability, including a physical, sensory, psychiatric, intellectual, or other mental disability. The work or tasks performed by a service animal must be directly related to the handler’s disability. The crime deterrent effects of an animal’s presence and the provision of emotional support, well-being, comfort, or companionship do not constitute work or tasks for the purposes of this definition. The animal is not housebroken. Per District and College policies, except when children are enrolled in the Child Development Center, other instructional programs in the District, and/or attending public events under the supervision of parent or guardian, bringing children on campus while attending classes is not permitted. Parents and guardians must be aware that the ultimate responsibility for the safety of the children in their care rests with them and no liability can be accepted by the District nor any of its agents or staff for the consequences of children being on campus. Check-out contract is completed by the student’s instructor. Students without written reservations in the form of a completed contract cannot check-out equipment under any circumstances. Student must present identification at time of check-out. All check-out sheets must have both student and staff signature to validate the contract. All photography equipment for check-out is on a first-come, first-served basis. Students making up an incomplete must be enrolled in a Grossmont College class to check-out equipment. Pick-up of Grossmont College photography equipment for off-campus check-out and use is on Fridays only from 9:30am to 3:00pm. Students can pick-up equipment from the Photography Lab Technician until 3:00pm. All returned equipment must be brought to 20-110. Overdue equipment will result in a one week suspension of borrowing privileges. A second incident of overdue equipment will result in the loss of borrowing privileges for the remainder of the semester. No equipment can be checked-out for off-campus use after the 15th week of instruction. Check-out of photography equipment for on-campus use only, including cameras and/or studio lighting equipment, is done during course hours and is required to be returned after completing on-campus photographic work. Check-out contract is completed by the student’s instructor and/or with the Photography Program Lab Technician or Program Teaching Assistant. The semester-long check-out contract is completed by the student’s instructor. Equipment is available and permitted to be checked-out from weeks 3 – 15 of course instruction. During the check-out period, the students academic records will be placed on hold to cover equipment liability matters, and as such, students will not be able to register for courses or request transcripts. If a student needs to register for classes and/or request transcripts, it will be necessary for the student to request a temporary release of the hold with the instructor. As it may take a business-day to complete the request, students are asked to request this temporary release in a timely manner. Continued positive attendance is required to continue to have equipment checked-out. Excessive absences and attendance issues will result in borrowing privaleges being revoked. The Photography Program Lab Technician does not inspect, repair or instruct students in the use of their equipment. Any such questions should be directed to the Course Instructor. There are no exceptions nor allowances of these procedures and policies when checking-out Grossmont College Photography equipment. The following is general outline of the various activities you may be engaged with during semester. The evaluation of your photographic efforts will be based on your effort in understanding and demonstrating the aesthetic and technical principles discussed throughout the course in the development of your sense of artistic vision and technical craft. While it will be important to develop and exercise proficient technical execution with the camera and in the darkroom, it will be equally important for you to demonstrate engagement with your ideas as they relate to photography’s conceptual and aesthetic possibilities. Your final grade will be determined by a culmination of points earned based on your performance with the below listed curriculum assignments. Questions regarding curriculum assignment grades and/or the final grade must be brought to the attention of the instructor. To provide equitable instruction for all students while during class hours, please ask questions regarding your grade during instructor office hours or after class. Students are expected to demonstrate active and engaged learning with the curriculum and assignments while attending each class session and in-class laboratory practice. Students must be present during the entire class as well as engaged and participating with the Working Process and Daily In-Class Lab Discussion | Practice Assignments in order to receive credit. The Working Process and Daily In-Class Lab Discussion | Practice Assignments may include in-class shooting and technical assignments, critical issues discussions and/or responses as well as daily photographic lab practice (analog/darkroom and/or digital) with the curriculum during the entire class session. Engagement, participation and completion of the Working Process and Daily In-Class Lab Discussion | Practice Assignments are evaluated for each day the course meets, with 100% of the evaluation points earned for each hour of engagement and participation. If you arrive late and/or leave early at any time during the class, you will only receive credit for the curriculum activities while you’ve been participating in class. 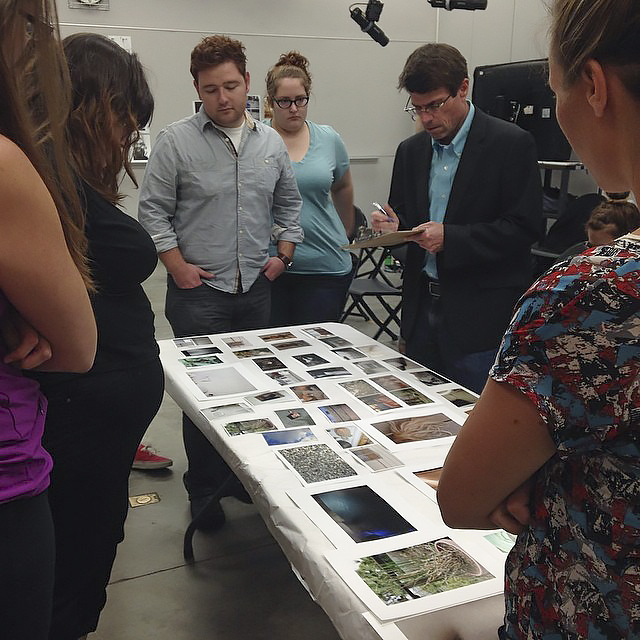 Throughout the semester, there may be informal, 20 – 30 minute discussions in class as well as postings on the course website on various critical issues and readings on the photographic image and visual culture within both historical and contemporary contexts. Topics will explore various issues regarding photography, the history of photography, on being a photographer, as well as the sociological, psychological and cultural implications of the photographic image. For studio courses, a 1 – 2 paragraph (approximately 60 – 100 words) written response will be required to be typed (handwritten not accepted) and turned-in before or after the discussion. For lecture-only courses, textbook summaries will be required to be completed prior to the discussion of a given chapter. It will be essential to demonstrate comprehension and basic understanding of critical ideas raised by the presentation and/or reading. With each assignment, you’ll be asked to make photographic images that explore various aesthetic and technical considerations within the contexts of conceptual possibilities that are open to your individual interests. The assignments will focus on historical and contemporary conceptual approaches within the photographic medium, the use and function of a photographic sensibility and visual language, photography’s primary aesthetic considerations, including the nature of content; the photographer and cameras’ physical relationship to subject matter; moments of exposure; the photographic frame and compositional considerations; the attention to descriptive details; the role and use of light as well as the consideration and use of photographic materials (analog | digital, color | grayscale and alternative processes). Once the images have been shot, you’ll develop a working process, including the making of contact sheets and edited contact sheets to edit for visually engaging and stimulating images, and print photographic prints with a considered sense of technical execution and craftsmanship. Upon the completion of each assignment, there will be a critique for discussion and feedback of your photographic efforts. Development of your vision, conceptual engagement and approach of photographic strategies as demonstrated through the completion of assigned images made, the making of contact sheets and/or edited contact sheets as well as your interpretation of the assignment objectives through your use of aesthetic considerations, including the use and application of photographic theory, principles and use of materials, the role and use of light, the nature of photographic description, compositional organization strategies and techniques in suggesting emphasis of pictorial content. Technical execution with consistent and correct camera usage, image exposure and the execution of correctly exposed contact sheets and/or edited contact sheets. Technical execution and sense of craftsmanship with the critique images, including correct density and contrast, color/tone correction, and secondary optimization controls. With each of assignments, you are strongly encouraged to show me your contact sheets and/or edited contact sheets so I can provide guidance with your conceptual concerns, shooting and editing process. The Technical Assignment(s) will include discussions, demonstrations and assignment(s) on the technical principles of photography, including the use digital and analog technologies and techniques for producing photographs. It is expected that you complete the required readings as well as actively take notes during class discussions and demonstrations to assist you in the refinement of your technical skills. With the technical assignment(s), your effort will be evaluated on your understanding of the technical principles presented through your execution and sense of craftsmanship. 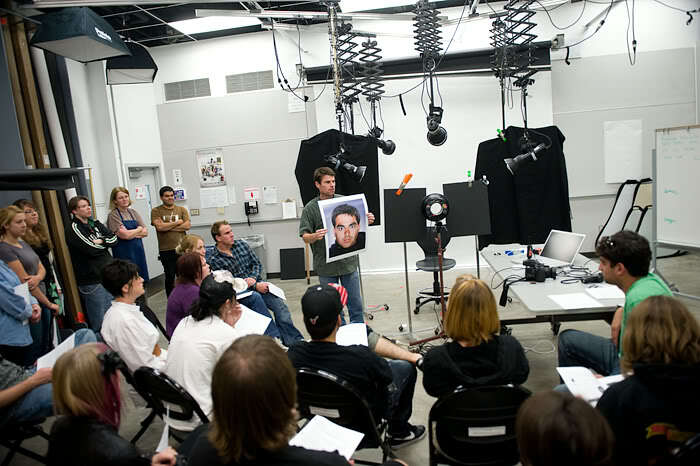 The Student Learning Outcome (SLO) Assessment Assignment | Exercise is a departmental assignment for all students enrolled in a particular photography course at Grossmont College. The assignment | exercise is designed for the student to demonstrate the understanding and knowledge of a the assigned objectives and outcomes of a given photography course. Such (SLO) Assessment Assignments | Exercises may include any combination of an image-making and/or technical assignment, critical writing exercise, exam and/or preparation and completion of a final project depending on the course enrolled in and will be evaluated based on stated course outcomes. The quizzes and final exam will consist of multiple choice and short answer questions covering material from the class discussions, demonstrations and class handouts. The quizzes will be shorter in length, covering specific topics related to lectures and demonstrations, while the final exam will be inclusive of all material covered during the semester. It is expected that you complete the required readings as well as actively take notes during class discussions and demonstrations to assist you in the refinement of your technical skills, including the conceptual, aesthetic and technical concerns of photography within the context of the photography course enrolled in. There will be no make-up quizzes if you are unable to attend class on the assigned quiz date. The final exam will be inclusive of all the material covered during the class, including lecture handouts, in-class discussions and demonstrations and the assigned readings. The final project will consist of a portfolio of photographs processed (image processing and printing) in the Grossmont College Photography Lab (analog or digital) and/or within the context of various presentation strategies, including a print portfolio, artist book and/or website, that reflects the cohesive development of your photographic vision, aesthetic sensibilities and technical execution. Development of your vision, conceptual engagement and approach of photographic strategies through your use of aesthetic considerations, including the use and application of photographic theory, principles and use of materials, the role and use of light, the nature of photographic description, compositional organization strategies and techniques in suggesting emphasis of pictorial content. Technical execution and sense of craftsmanship with the photographs, including correct density and contrast, color correction and secondary adjustment controls. Professional completion of the project, including image finishing and a consistent image presentation technique. The points earned for each course curriculum activity are based on a percentage of the total points possible for each evaluation consideration. 100% – Exceptional performance, effort and accomplishment in demonstrating engagement with assignment objective(s)and superior technical execution. 90% – Excellent performance, effort and accomplishment in demonstrating engagement with assignment objective(s) with minor attention necessary with either an aesthetic and/or technical execution consideration. 80% – Good performance, effort and accomplishment in demonstrating engagement with assignment objective(s) with additional attention necessary with no more than one aesthetic and/or technical execution consideration. 70% – Satisfactory performance, effort and accomplishment in demonstrating engagement with assignment objective(s) with additional attention necessary with at least two aesthetic and/or technical execution considerations. 60% – Unsatisfactory performance, and effort in demonstrating engagement with assignment objective(s) with additional attention necessary with at least three aesthetic and/or technical execution considerations. 50% – Unacceptable performance, and effort in demonstrating engagement with assignment objective(s) as well as failing to complete the assignment considerations. It is expected that all assignments are executed and turned-in for evaluation on the assigned date at the start of class. Assignments completed late after the assigned evaluation date will not be accepted unless prior arrangements have been made with the instructor before the assignment due date in consideration of extenuating circumstances and with timely communication with the instructor (i.e. extreme emergency situations, including illness, personal/family care and bereavement matters). The student has contacted the instructor of the course and both have agreed to the provisions established in the Incomplete Grade Contract. The student has had an unforeseen emergency that prevents them from completing the remaining course work. Evidence to verify the emergency may be requested/required. The student has completed a minimum of 50% of the required course work, as specified in the course syllabus, with regular attendance, and there is still the possibility of earning a passing grade. Completing the coursework as outlined in the Incomplete Grade Contract. Upon satisfactorycompletion, the instructor will replace the “I” with a grade. The “I” is not used in calculating GPA or units. The “I” cannot be cleared by re-enrolling in the course. The grade earned on the portion of work completed for the course (as specified in the course syllabus) must be used to calculate the final grade for the course. A signed Incomplete Grade Contract in which the student agrees to complete remaining coursework, must be filed by the instructor. In the case of an extreme emergency where the student is unable to meet with the instructor, the instructor may initiate and file the Incomplete Grade Contract, sending a copy to the student for signature. The contract is invalid without both instructor and student signatures. Without the student’s signature, the I will revert to the default grade at the end of the following semester. Class time and/or assignments outlined in the Incomplete Grade Contract must be completed by the end of the 16-week semester following the date on the contract. If not, the “I” will revert to the default grade assigned on the Incomplete Grade Contract. An extension of time for removal of the “I” must be petitioned by the student. The petition must include evidence of approval from the instructor. In the event that the original instructor of record on the Incomplete Grade Contract is unavailable, the student must see the appropriate department chair or dean for alternate arrangements. © Paul Turounet | 2019. Works created by others is credited, copyright protected and presented for academic scholarship and educational purposes only.